Home › Energy & Performance › Are Sports Drinks a Good Way to Stay Hydrated? We all see commercials claiming that sports drinks help boost our energy and athletic ability when exercising or engaging in physical activities. These advertisements promote their positive effects and leave the impression that sports drinks are essential to improving our performance, hydrating our bodies, and giving us an edge. But are these drinks really better than water? What are the scientific reasons to consume sports drinks? Have we simply become conditioned to think we need them? While there is some conflict about the best way to rehydrate and maintain energy levels during physical activity, one thing that is not debated is the importance of hydration. Every cell, tissue, and organ in your body needs water to work correctly. Your body uses water to maintain its temperature, manufacture hormones, remove waste, and lubricate joints. Water even acts as a “shock absorber” for the brain and spinal cord. Essentially, you need to be hydrated to be healthy. This is why a human can survive significantly longer without food than without water. We need to stay hydrated no matter what our level of activity is but when we spend time in the hot sun and/or exert ourselves physically, hydration is even more important. Research indicates that for each pound (16 ounces) of water weight we lose, we need to drink more than 16 ounces of water to make up for it due to the way our intestines absorb water before it reaches the bloodstream. This is in addition to the approximately 64 ounces of water we need to be drinking everyday anyway (though the exact amount one needs depends on size, gender, and the environment you are in). Here’s something interesting to keep in mind: people don’t typically feel thirsty until they have lost around 2-3% of their body’s water. However, mental performance and physical coordination start to become impaired before thirst kicks in, typically around just 1% body water loss. This shows how important it is to stay hydrated throughout the day to function at the highest level possible. According to the institute of Medicine, it is estimated that nearly 75% of Americans are not drinking enough water for optimal performance and health. One easy way to tell if you are dehydrated at any particular time is by observing the color of your urine. If it is light yellow, you are fine. If it is a dark yellow, it means you are already dehydrated and need to drink some liquid immediately to restore your body’s water levels to normal. When we are dehydrated, it can make us feel tired since the volume of blood in our body is lower and our heart has to work harder to deliver oxygen and nutrients throughout the body. Additionally, dehydration can cause increased muscle soreness and longer recovery periods from activities. Sports drinks attempt to give you a carefully formulated beverage that will hydrate you, replenish the bodily materials that you sweat out, and taste good. The most popular (and allegedly first) sports drink, Gatorade, was invented in 1965 by the medical team for the University of Florida Gators. It wasn’t until the 1990s, thanks to some popular advertising campaigns, that sports drinks really boomed in popularity. Most sports drinks are comprised of three main components: electrolytes, carbohydrates, and water. We all know the importance of water, but the value of electrolytes and carbohydrates make them worth learning a little more about. Humans require a complex balance of electrolytes. Without these electrolytes (such as sodium, potassium, chloride, and magnesium), our body struggles to maintain and regulate nerve and muscle function, acidity levels, and fluid levels. Electrolytes also maintain your blood volume and sweat rate, since electrolytes like sodium allow the body to better retain the water needed to make more blood. For these reasons, it is quite disruptive to the body when electrolyte levels are too low. When we perspire, we not only lose water, but electrolytes that need replacement. Although carbohydrates are sometimes given a bad name by certain diet trends, your body actually likes carbohydrates because they are your muscles’ main source of energy when working at moderate to high intensity. Although all carbs are broken down into simple sugars and are important to power cellular activity and support heart, kidney and brain function, the source of the carbs you eat is important. There are simple and complex carbohydrates. The complex carbs are those you would get from grains or fruit and simple carbs being the kind you might find in soda or candy. In general, complex carbohydrates are preferable because they come from plant-based foods with nutritional value. For instance, a simple carbohydrate like fructose can be found in both fruit and candy, but the fruit also comes with complex carbohydrates like fiber and other nutrients that the candy does not include. You generally want the majority of the carbs you eat to be of the complex variety. When you are looking for immediate energy in a physical performance situation, though, you can get it quickly from simple carbs like glucose, fructose, or galactose. For example, if you are jogging for a long period of time and start feeling sluggish, a quick-acting dose of fructose can give you the energy you need to finish strong. When you consume carbs (simple or complex) before exercise, they can help performance by “topping off” muscle and liver energy stores (glycogen). According to Medicine & Science in Sports & Exercise, consuming carbohydrates during exercise results in better exercise performance for 1 hour sessions of intermittent high intensity exercise, as well as for more prolonged (greater than 90 minutes) endurance exercise such as long distance running and triathlons. This is because consuming carbs while exercising maintains blood glucose levels. Consuming carbs after exercise helps replenish your muscles’ glycogen levels. It is for these reasons that carb-containing sports drinks are believed to help boost your physical performance. While there are other kinds of products to get carbohydrates and electrolytes during exercise, sports drinks conveniently incorporate them into your hydration source. Another selling point for sports drinks is that those tasty flavors that sports drinks are known for aren’t just for fun. A study from the Journal of Applied Physiology found that people will drink more of a flavored drink than an unflavored one. Hence, a refreshing, palatable beverage like a sports drink enhances total fluid intake and reduces the risk of dehydration. While the science is compelling in regards to how sports drinks can benefit people engaging in fairly high-intensity physical activity, it is less clear if sports drinks help those who are less active. A review of existing studies, published in the British Medical Journal, came to the conclusion that most people get what they need from just plain water (“the original sports drink”) as long as they aren’t pushing themselves too hard. Another concern about sports drinks is that the additional sodium you get from your sports drink might actually hinder your physical ability. A study from the Australian Institute of Sport warns that excessive salt (sodium) supplementation during exercise may actually lead to “gastrointestinal problems or cause further impairment of fluid balance”, and suggests that athletes who ingest more salt than necessary during competition could be susceptible to salt-induced cramps during their sporting events. Too much water (without electrolytes) can be dangerous too. Hyponatremia, or over hydration, has gained media attention in the last few years from water-drinking contests that led to the death of one of the contestants. However, over hydration is a risk mostly associated with ultra-endurance sports or sports lasting more than 2 hours when athletes are rehydrating with just water. A study of marathoners at the 2002 Boston Marathon showed that approximately 12% suffered from hyponatremia, which happens when sodium in the blood stream is reduced to a level that swelling of the brain occurs which can lead to confusion, seizures, coma and even death. The old advice to “drink as much water as you can” is no longer sage advice – especially for the smaller athlete who can dilute their blood serum sodium levels more quickly than larger individuals. That being said, I think a comprehensive and well-balanced sports drink is a valuable tool for those who push themselves athletically as well as those whose idea of a good workout is putting in some time in the garden on a hot day. If you are not often engaging in high-intensity exercise, you don’t need to be regularly consuming sports drinks. However, if you feel especially thirsty and sweaty after working in the yard or going on a long walk (especially in the hot and humid summer months), a well-formulated sports drink could be a great way to quickly restore proper electrolyte, carbohydrate, and fluid levels to the body. But what should you look for in a sports drink? For starters, it should taste good. If you like it, you will consume it and stay hydrated. Then, you need enough carbohydrates to give you energy, but not an excessive amount. It should be about 6-8% of the drink or about 21-28 grams of carbohydrates per 12 ounces. One thing your sports drink shouldn’t have in it is caffeine. If it does, it may be an energy drink instead of a sports drink (these two are commonly mistaken). Although some studies show that a little caffeine can be beneficial in a short activity, it’s not needed and can cause dehydration (since caffeine is a diuretic) and stomach problems in some athletes (not what you want during a race). A sports drink should also include the proper electrolytes (sodium, potassium, chloride, and magnesium). In particular, make sure it includes around 100 mg of sodium per 16 ounces (but no more than around 200 mg). This helps you retain fluid and get it moving to the right places without the risk of gastrointestinal issues that come with more sodium than the recommended levels. Also be sure to look for magnesium. Magnesium plays a key role in 300 enzymatic reactions and is a key nutrient in energy production that is difficult to obtain from the typical diet. Magnesium bis-glycinate (magnesium attached to the amino acid glycine) is the choice form as it ensures increased absorption and enhanced bioavailability of magnesium in the body for cellular metabolism and glucose regulation. Many Americans are thought to consume inadequate levels of magnesium from their diet. Very few sports drinks contain magnesium, which is strange when one considers magnesium’s role in energy levels. 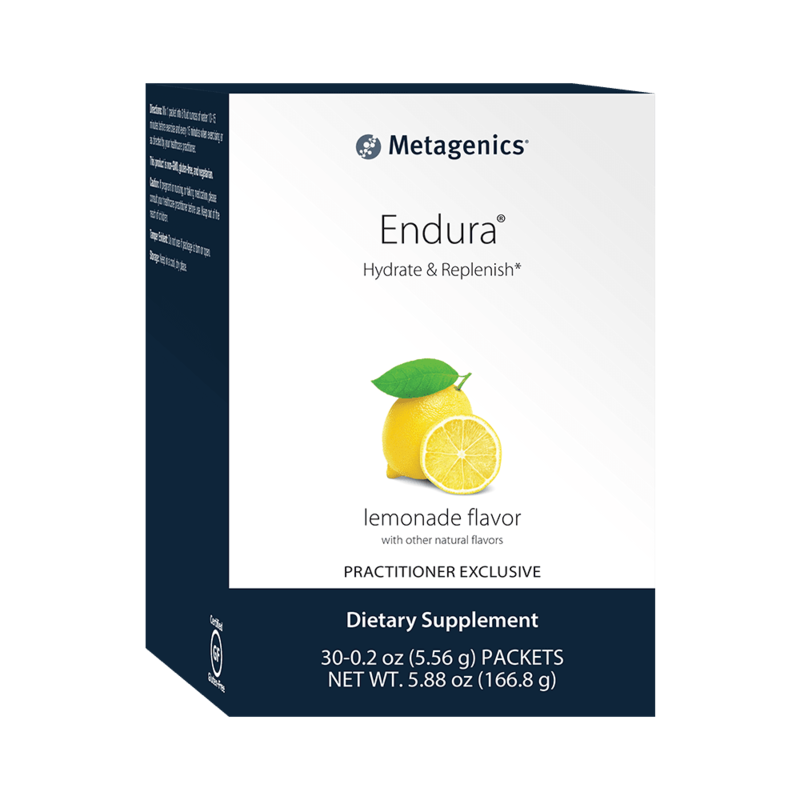 Fortunately, there are comprehensive, natural sports drink powders like Metagenics’ Endura and Designs for Health’s Electrolyte Synergy that (when mixed with water) are tasty hydration solutions. These drinks not only contain energy-producing magnesium, but also contain high-quality, natural ingredients while supplying carbohydrates in special, balanced ratios. Which sports drink helps the most? When most people think of sports drinks, they think of Gatorade and its main rival, Powerade. While these two brands have done the best job of marketing themselves and becoming household names, it does not mean that they are the best. As previously mentioned, magnesium plays an important part in energy production; however both Gatorade and Powerade have little to no magnesium whereas a drink like Endura contains 174mg per serving. Another thing to consider is the quality of ingredients in commonly-known, conventional sports drinks like Gatorade and Powerade. Powerade uses high-fructose corn syrup, a cheaper alternative to cane sugar, in many of its drinks. While the science is not completely settled on the matter, many avoid high-fructose corn syrup whenever they can due to its possible links to metabolic disorders like obesity and diabetes. Gatorade, in an attempt to make their artificially-flavored drinks look the color their marketing gurus want, uses artificial food coloring like red 40, yellow 5, yellow 6, and blue 1. While we don’t know for sure that artificial coloring has major adverse effects on your health, it doesn’t need to be included in your beverages and almost certainly won’t turn out to be beneficial to your body when all of the research has been performed on it. For those engaging in very light exercise, simple water will likely work just fine for you. But if you are exerting yourself, going for more than an hour, feeling particularly dehydrated, or living in a particularly hot area (or are prone to excessive sweating) a high-quality, specially-formulated sports drink like Endura or Electrolyte Synergy could be just what you need to stay cool. Endura is a specially formulated electrolyte beverage featuring all-natural ingredients and less sugar than comparable, conventional products. While there is some conflict about the best way to rehydrate and maintain energy levels during physical activity, one thing that is not debated is the importance of hydration. Every cell, tissue, and organ in your body needs water to work correctly. Your body uses water to maintain its temperature, manufacture hormones, remove waste, and lubricate joints. Water even acts as a “shock absorber” for the brain and spinal cord. Essentially, you need to be hydrated to be healthy. This is why a human can survive significantly longer without food than without water. Research indicates that for each pound (16 ounces) of water weight we lose, we need to drink more than 16 ounces of water to make up for it due to the way our intestines absorb water before it reaches the bloodstream. This is in addition to the approximately 64 ounces of water we need to be drinking everyday anyway. Here’s something interesting to keep in mind: people don’t typically feel thirsty until they have lost around 2-3% of their body’s water. However, mental performance and physical coordination start to become impaired before thirst kicks in, typically around just 1% body water loss. Electrolytes: Electrolytes (such as sodium, potassium, chloride, and magnesium), our body struggles to maintain and regulate nerve and muscle function, acidity levels, and fluid levels. Electrolytes also maintain your blood volume and sweat rate, since electrolytes like sodium allow the body to better retain the water needed to make more blood. Carbohydrates: Although carbohydrates are sometimes given a bad name by certain diet trends, your body actually likes carbohydrates because they are your muscles’ main source of energy when working at moderate to high intensity. When you consume carbs (simple or complex) before exercise, they can help performance by “topping off” muscle and liver energy stores (glycogen). According to Medicine & Science in Sports & Exercise, consuming carbohydrates during exercise results in better exercise performance for 1 hour sessions of intermittent high intensity exercise, this is because consuming carbs while exercising maintains blood glucose levels. Consuming carbs after exercise helps replenish your muscles’ glycogen levels. It is for these reasons that carb-containing sports drinks are believed to help boost your physical performance. A comprehensive and well-balanced sports drink is a valuable tool for those who push themselves athletically as well as those whose idea of a good workout is putting in some time in the garden on a hot day. If you are not often engaging in high-intensity exercise, you don’t need to be regularly consuming sports drinks. However, if you feel especially thirsty and sweaty after working in the yard or going on a long walk (especially in the hot and humid summer months), a well-formulated sports drink could be a great way to quickly restore proper electrolyte, carbohydrate, and fluid levels to the body. A sports drink should also include the proper electrolytes (sodium, potassium, chloride, and magnesium). In particular, make sure it includes around 100 mg of sodium per 16 ounces (but no more than around 200 mg). Many Americans are thought to consume inadequate levels of magnesium from their diet. Very few sports drinks contain magnesium, which is strange when one considers magnesium’s role in energy levels. When most people think of sports drinks, they think of Gatorade and its main rival, Powerade. While these two brands have done the best job of marketing themselves and becoming household names, it does not mean that they are the best. Gatorade and Powerade have little to no magnesium whereas Endura contains 174mg per serving. Powerade uses high-fructose corn syrup, a cheaper alternative to cane sugar, in many of its drinks. While the science is not completely settled on the matter, many avoid high-fructose corn syrup whenever they can due to its possible links to metabolic disorders like obesity and diabetes and Gatorade, in an attempt to make their artificially-flavored drinks look the color their marketing gurus want, uses artificial food coloring like red 40, yellow 5, yellow 6, and blue 1. For those engaging in very light exercise, simple water will likely work just fine for you. But if you are exerting yourself, going for more than an hour, feeling particularly dehydrated, or living in a particularly hot area (or are prone to excessive sweating) a high-quality, specially-formulated sports drink like Endura could be just what you need to stay cool.